We areone of only 21 Microsoft Authorized Refurbishers in the U.S. MAR stands for "Microsoft Authorized Refurbisher". It depends on your needs. Not satisfied with it?. Product Information. Model: EliteDesk 800 G4 SFF. CPU Model: Core i7 8700. Hard Drive: 1TB HDD. We are not an authorized dealer of this product and any warranty included with the product may not be honored by the manufacturer. • 250GB HD. • USB WIFI b/g/n. • Genuine Windows 10 Pro (Upgraded From Windows 7 Pro). Windows 7 Pro can be installed by leaving a note in check out. No power cord included. They are in good condition. See pictures for details and specifications. By purchasing from us, you are taking part in helping this marketplace flourish. Shows normal signs of use. Powers on as it should. HP PRODESK 400 G1 w DoD wiped. Fully functioning units. This system is working and ready to use. Other than that, the computer is in excellent shape. 250GB Hard Drive. AMD Athlon 64 x2 2.7ghz Dual Core Processor 5200 . Also included is Microsoft Office 2007 (already installed). Storage HDD 500GB. Optical Drive DVD /-RW. Interfaces USFF : 4x USB 3.0 (2 front, 2 rear); 2x USB 2.0 ( 2 rear); 1x LAN (Gigabit Ethernet); 1x VGA; 2x DisplayPort; 2x Line-in (stereo/microphone); 2x Line- out (headphone/speaker). 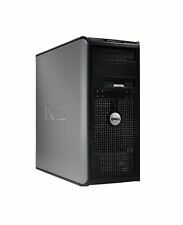 • Dell OptiPlex 960 Core 2 Quad 2.40 GHz Small Form Factor PC. Work or play, this Dell OptiPlex 960 Small Form Factor PC has you covered! Connect to local networks and the Internet at blazingly fast speeds with the integrated Gigabit Ethernet LAN. HD: IDE SATA500 GB. Processor: i33rd Gen. Processor Speed: 3.30 ghz. Extra Ports: Mic / headphones/ Ethernet. # USB Ports: 0. Output: VGA,00. DVD/RW: DVD RW. 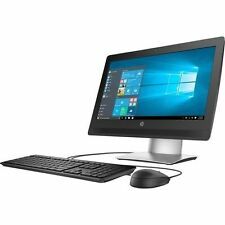 HP 280 G1 Slim Tower PC - Core i3-4170 - 4GB RAM - 500GB HDD 3CR619059H (P5V1.... Condition is New. Shipped with USPS Priority Mail. Product # is 4SX33UT#ABA so you can look at all the specs. 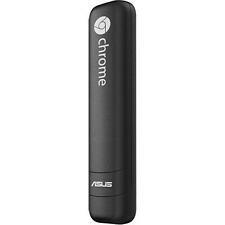 ASUS CHROMEBIT-B013C (eMMC, Rockchip, 1.80GHz, 16GB) PC Stick. Shipped with USPS Priority Mail. Includes stick, AC adapter and HDMI extender. Windows 10 Home Pro 4GB 8GB 16GB Memory 500HD 1TB 2TB! 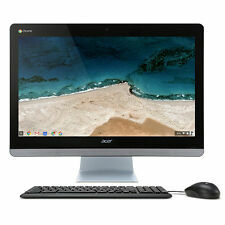 Modernize any workspace with an AiO PC that makes a great first impression. Amazing from any angle Count on this purposefully designed AiO to impress. HP warranty in effect until: April 10, 2022. Firmware level protection Protect the firmware that antivirus can’t reach! Lenovo H50-50 Desktop i3-4170 3.70Ghz | 8GB RAM | 1TB HDD | Win10 | Wifi . Logitech Keyboard and Mouse included. Condition is Seller refurbished. Shipped with USPS Parcel Select Ground. 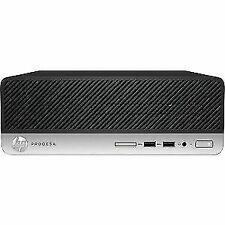 HP ProDesk 600 G3 Mini PC i5 - 1HL29AW. 1 USB 3.1 Gen 1. 1 USB 3.1 Gen 1 (charging). 4 USB 3.1 Gen 1. End Date December 13, 2020. Service Level Standard Material Handling Product Number 1HL29AW. 1 USB 3.1 Type-C™ (charging). MPN K1K41UT. 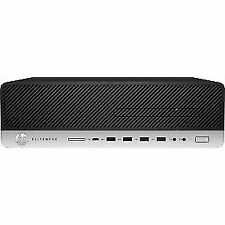 Model HP EliteOne 800 G1 AiO. Storage 1TB HDD. Manufacturer Hp. Accessories, options, and other features shown in the photo may not be included with the actual product. Product Details. Product Key on top of unit. HP Desktop computer. Monitor are well tested to full function. Buy from a Microsoft Authorized Refurbisher and know all software is Genuine! We strive to make sure your buying experience is perfect! The HP XW4400 Workstation 2.4GHz Core 2 Duo, 2 GB RAM, 250 Gb HD, Windows XP PRO, NVIDIA QuadroFX 1500 256MB excellent condition. Part#: XW4400. Product Line EliteDesk. Processor Type Core i7. Product Series 800 G4. Storage Total Solid State Drive Capacity 512 GB. Product Type Desktop Computer. 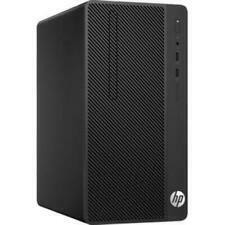 Manufacturer HP Inc. Manufacturers change colors and item details frequently and often do not update pictures. Lenovo ThinkCentre M83 Business PC i3-4130 Windows 8.1 Pro 10AKX50100 - NEW! Dell OptiPlex 990 Desktop. The Dell Desktop utilizes a Hard Disk hard drive that can hold up to 500 GB of information. Processor Overview. USB wired keyboard and Mouse. Keyboard & Mouse. DVD-RW AND FLOPPY DRIVE IN THE UNIT WORK GREAT. 4GB or RAM (2 x 2GB) - maximum of 8GB RAM (4 x 2GB). Windows Vista. -(H: 4.2" XL: 9"). 1 PCIe x1 full height. 1 PCIe x16 full height graphics. -(H: 4.2" XL: 11"). 1x Ethernet Port. Our techs will assist you to troubleshoot hardware errors over the phone. Warranty ?. item NON WORKING or NOT as described?. 8x USB 2.0 Ports. 7500T (2.70 GHz). 256GB SATA III 2.5" SSD. 600 G3 (1KB99UT#ABA). 8GB of 2400 MHz DDR4 RAM. 256 GB SSD. HP manufacture warranty till 07/23/2021. Windows 10 Pro (64-Bit). Mfg. p/n 1KB99UT#ABA. ThinkCentre M73. Lenovo ThinkCentre M73 Tiny Desktop PC; USB Keyboard & Mouse; Power Cables. Hard drive 128GB SSD. 8GB DDR4 SDRAM (2x4GB). Form Factor Tiny. Processor Speed. 1x Handset (Dual Usage). Item Condition: Manufacturer Refurbished. Storage 1TB 7200RPM hard drive. Audio Integrated HD audio internal speaker. Other Keyboard, mouse, and power cable included. Powerful quad core CPU. If we are unable to verify your order; your order may be cancelled. Dell Optiplex 7010 SFF Intel i7-3770 3.4GHz 8GB RAM, 500GB, Win 7 Pro. These computers are very well taken care of and very clean. There may be a minor scratch from use. All Dell drivers have been loaded as you can see in the pictures and Microsoft updates have been done. EliteDesk 800 G4 Desktop Computer i7-8700T 8GB 256GB UHD Graphics 630 Windows 10 Pro. P/N: 4CB16UT#ABA. 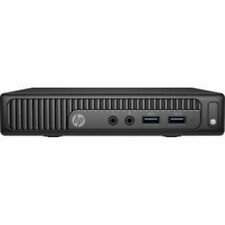 HP EliteDesk 800 Desktop Mini. SKU: 4CB16UT. MPN: 4CB16UT#ABA. Product Line: EliteDesk. Product Family: EliteDesk 800 G4. For sale is a Dell Optiplex 9010 with an i5 3.1GHz processor. The glass is cracked in several places, but the LCD and touchscreen are fully functional with no problems. 24X24 CDRW/DVD Combo,EIDE Slimline,Dell OptiPlex Small Form Factor ASSEMBLY, COMPACT DISK READ WRITE/DIGITAL VIDEO DISK DRIVE COMBO, 24, Serial ATA, SLCY, HLD. Floppy Disk Drive 1.44mb. RAM : 320 MB. 500GB 7,200RPM Hard Drive. 4GB DDR4-2400 SDRAM. 7500 (3.4GHz). 280 G3 PCI Microtower Desktop Computer. Microsoft Windows 10 Pro. Windows 10 Pro. CASE & MOTHERBOARD. Case Orientation. 1x HP EliteOne 800 G1 AiO. Primary Drive: 500GB HDD. Screen Size: 23". 100% of Proceeds Support Tech Donations for People-in-need. Form Factor: All in One. Competitive Prices. Bookmark Us. Our great team provides refurbished technology; digital literacy and vocational training to as many qualified humans as possible. 4 x USB 3.1 Gen 1 Type-A, 2 x USB 2.0 Type-A, 2 x DisplayPort, 1 x DB-9 Serial, 1 RJ45. Windows 10 Pro 64-bit | Keyboard Mouse Included, Limited 3-Year Warranty for Parts and Labor. 802.11ac Wi-Fi | Bluetooth 4.2, 1 x M.2 PCI Expansion, 1 x 1/8" (3.5 mm) Headphone Output, 1 x 1/8" (3.5 mm) Headphone/Microphone Combo Jack.